On 2nd May, 2017 the closure joint (final section) of the Hong Kong-Zhuhai-Macao Bridge (HZMB) Immersed Tunnel was installed. 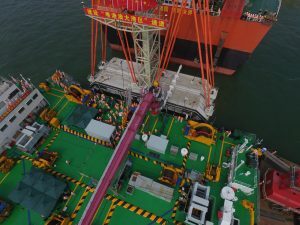 The world’s largest crane vessel “ZhenHua 30” (SWL 12.000 tons, built in China) was used by the contractor, CCCC JV Team from China, to place the 6000 tons closure joint structure. 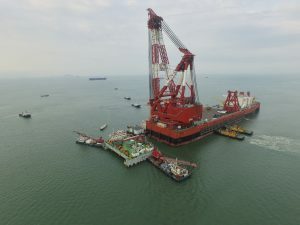 On behalf of TEC (design and construction consultant for tunnel and islands of this project), Managing Director Hans de Wit and Project Manager Ying Li were present to witness this great event. TEC congratulated the Client Organisation (HZMBA) and the Contractor CCCC JV with this excellent achievement. With the closure joint in place the HZMB tunnel has become the longest immersed road tunnel. The tunnel is planned to be open for traffic at the end of this year.